Whether teaching in Sunday School or another type of Bible study class, you need to teach people in ways they can understand. These Bible teaching resources will help you in both the preparation and presentation of your lessons to creatively, developmentally, and purposefully communicate God's Word. Click on a tab below to view a list of resources related to the teaching-learning process such as the Bible lesson, teacher, students, methodology, creativity and other elements. Can We Ever Overemphasize Application? How Deliberate to be About Application? What to Aim for in Application of a Bible lesson? Whose Responsibility is Bible Application? Are You a Creative Bible Teacher? Bulletin Boards - Article: Bulletin Boards: An Old Method Still a Viable Tool? Games - Article: Fun & Games and Bible Learning? Games - Article: Games Are Good As Long As . . .
Lecture - Article: Lecture is Good to Use with Adults, Right? Lecture - Article: No Choice But to Use Lecture with Adults? Play - Article: Play as a Bible Teaching Method? Students Glad to Go to Class? Bible Teachers Goal to Advance God's Work? Called to Teach But Still Afraid? Just a Teacher's Helper? Ouch! How Enthused are Your Bible Teachers? Do You Know What Kind of Help Your Teachers Really Need? 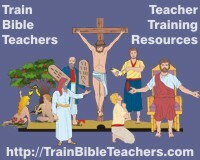 Recruiting Bible Teachers New to Teaching? May God work through you to impart not only head knowledge in your students but also a growing heart knowledge of Him. Use these teaching tools and resources but rely on the Holy Spirit to do the real work in people's hearts.